There is no dearth of accommodations in Bangkok, but if you are exclusively looking for best places to stay in Bangkok that guarantee a local, humble experience, the Laksameenarai Guesthouse is a great option. Depicting the design of a traditional Thai house, this yellow colour structure dawning a contrastingly beautiful green, sloping roof is certain to strike you the minute you see it. The interiors are rendered a cosy ambiance with the use of wood, lots of upholstery and fresh flowers. Choose your pick from the twin bunk bed shared bathroom, superior shared bathroom and the deluxe ensuite; you are going to experience a lovely stay! 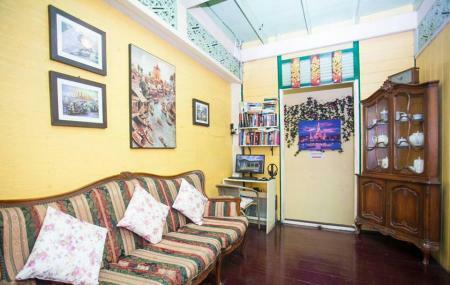 How popular is Laksameenarai Guesthouse? People normally club together Somsak Pu Ob and Max Tattoo Studio At Khaosan Road while planning their visit to Laksameenarai Guesthouse. If you're staying in the dorms, they look much bigger and nicer in the photos. They are tiny, claustrophobic rooms with no where to store your bags. AC is on but hardly works, and the fans are noisy and broken. Rooms smell musty/mildew. I believe the good reviews are from people who had private rooms. I always book budget hostels, and this is one of the worst. Only stayed here to sleep. Having said that the house looks really traditional and beds are good. Showers are a bit weak but for the price I can't complain. I would recommend if you want somewhere cheap to stay. Traditional place. Room is small and limited number of bathrooms. Room has AC so good in hot situation. Can be hard to find but cheap and cheerful. 4 bed dorm is small but location is great to walk to the bars and restaurants.